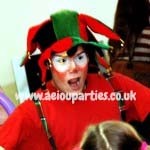 We organise children’s events in London. The planner will organise fun activities such as magic shows, puppet shows, clown shows, themed parties, music, face painting, balloon modelling, bouncy castles, entertainment, venue decorations, catering and more for children birthdays, christenings, communions, weddings, bar mitzvahs, bat mitzvahs & all other occasions for parents/ carers/ schools/ nurseries/ companies who are hosting a kiddies party, fete, fayre.. The Children’s events in London are for Londoners and celebrants at any venue in parts of Kent and Essex too. We travel to: Barking and Dagenham, Barnet, Bexley, Brent, Bromley, Camden, Croydon, Ealing, Enfield, Greenwich, Hackney, Hammersmith and Fulham, Haringey, Harrow, Havering, Hillingdon, Hounslow, Islington, Kensington and Chelsea, Kingston upon Thames, Lambeth, Lewisham, Merton, Richmond upon Thames, Southwark, Sutton, Tower Hamlets, Waltham Forest, Wandsworth & Westminster. Our children’s events in London are tailored to any theme (Super heroes theme, Jungle theme, Circus theme, Frozen theme..)and can be a grand jamboree in a large, swanky hotel in London or a cosy get-together in the comfort of your home! We are the best party planners around! This is the perfect package for children of all ages. The Classic can be tailored to any theme and has everything all children’s party/ event needs! 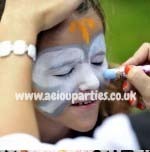 Face-painting: we paint any character that the children request. This is the perfect Princess party that brings the Disney magic to little girls birthday parties and other events across London! 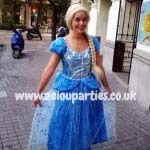 The Frozen themed party is for children all ages. Includes the activities of the Classic package: introduction, games, music, face painting and ballon modeling. An amusing and interactive tale is told using puppets–this is perfect for children under 6 years; for school/ nursery events, birthdays and community events. Soft, cuddly puppets are used to capture children’s imagination! This is perfect for the younger celebrants who are at the stage of learning through their senses. The puppet show is interactive, fun and enchanting! Our professional Magic show is perfect for inquisitive minds and guarantees an event of ‘oohs’ and ‘aahs’. The Magicians make things appear and disappear, change colour, levitate and more! You can also opt for a Magic show followed by a magic workshop where the children will learn their own magic tricks! Harry Potter: Professional magic shows and mini magic workshops…. 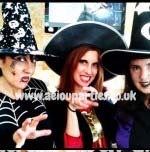 Create spooks, frights and laughter with Halloween themed parties. Witches, Skeletons, Angels, Zombies, Bats & Vampires will create the perfect Halloween atmosphere! Hire Santa and his helpers for birthdays in December or Christmas parties in schools, nurseries or corporate Christmas events! All music, songs, face painting, balloon modelling, costumes are festive and truly brings the spirit of Christmas to the party! Our children’s events in London are the best! 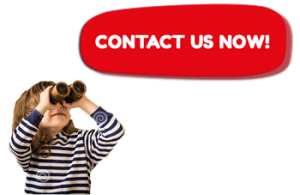 We offer great quality: a trained team of birthday party entertainers, quality costumes, professional equipment and all this at competitive prices! Our entertainers are DBS checked and have experience of entertaining children at large, small, private and corporate functions! 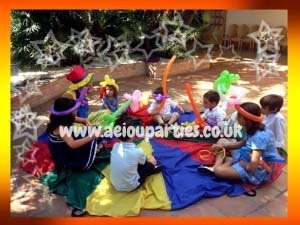 Children’s events in London: We provide entertainment, catering, venue decorations, mascots, Face painters, Balloon modellers, Magicians, Clowns, Puppeteers, children’s entertainers and more for kids’ birthdays, Christmas parties, Christenings, Chanukah parties, weddings and so much more. See our activities page and price list for more information, or call for a non – obligatory quote.